I doubt the rancher who owns this tiny roadside outbuilding shares my enthusiasm for the patterns of blistered paint on its corrugated walls. 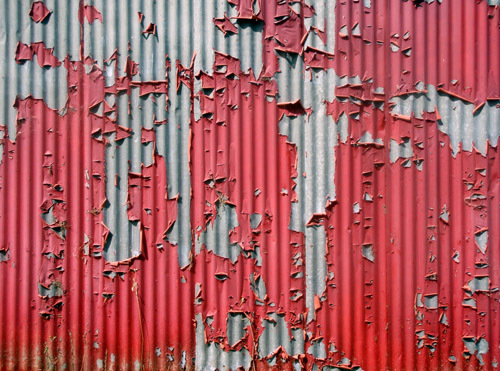 He’d probably agree that it needs repainting and was a poorly executed job to begin with, or that the galvanized steel was best left exposed to the elements without any paint at all. By the time it took the paint to blister, the wall would have developed a lovely patina of blotchy moss and pitted corrosion, given the proximity to the oft-fog-shrouded coast. So, my digressive conclusion is that any hand wrought thing works best when the aesthetic of its own decay is considered a design requirement. Posted by Scott on September 24th, 2009, at 5:28 pm, and filed under all, Best Posts, Emergence, maintenance, visceral inquiry.